Ruby Rose's casting as Kate Kane in the upcoming Batwoman television series has won the endorsements of both Arrow star Stephen Amell and Batwoman co-creator Greg Rucka. The praise from Rucka and Amell marks only the latest in a long wave of approval regarding the Orange is the New Black actress's casting as the superhero. The character will be introduced to the Arrowverse in this fall's annual crossover event between several of The CW's superhero shows. The first Batwoman, Kathy Kane, was introduced as a love interest for Bruce Wayne in Detective Comics #233 (July 1956) in a bid to counter the charges leveled by the 1954 book Seduction of the Innocent that Batman and Robin's relationship was homosexual in nature. This fact was firmly in the minds of writers Greg Rucka, Grant Morrison, Mark Waid, Keith Giffen and Geoff Johns, when they decided to introduce an out-and-proud Jewish lesbian Batwoman into the DC Comics multiverse. Enter Kate Kane, a cousin of Bruce Wayne on his mother's side, who had trained all her life to be a soldier but resigned her commission rather than break the US Army honor code by lying when her romantic relationship with another female soldier was revealed to her superiors. She would later take up the Batwoman identity to protect her city, with the assistance of her father, Col. Jacob Kane, not learning of her family ties to Batman until later. Rucka, who did more than any other writer to develop Kate Kane as a character in her solo series following her introduction in the mini-series 52, gave his seal of approval to Rose's casting on Twitter. Noting that his own opinion was largely meaningless given he is not involved with the production of the television series, Rucka said in subsequent tweets that he thought Rose was a capable actress but that the writing of the show would ultimately define Kate Kane as a character. 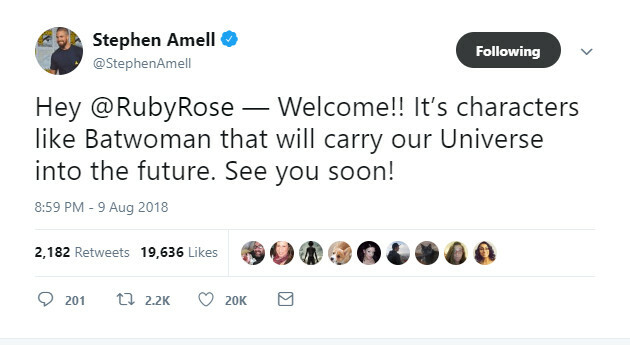 Stephen Amell was less reserved as he welcomed Rose to The CW family with a tweet. Amell also spoke of the increasing diversity of the Arrowverse and the important role that Batwoman and characters like her play in seeing all manner of people represented by heroes to whom they can relate. Amell and Rucka offering their support to Rose poses no surprise to those familiar with their work. Rucka is one of the most outspoken advocates of diversity in American comics, having co-created and developed numerous female heroes for DC Comics while writing one of the most acclaimed runs of Wonder Woman of all time. Amell is just as much of a social justice warrior as the character of Oliver Queen, having given his name, time and money to numerous charities. While their approval ultimately does nothing to affect the production of Batwoman, it may help to calm the fears of those who worry Rose's casting was driven entirely by the desire of producers to cast a lesbian actress in the role of Kate Kane.